It was a double celebration for the Baptist community yesterday at the 14th anniversary of Shouter Baptist Liberation Day celebration at the Shouter Baptist Empowerment Hall, Churchill Roosevelt Highway, Maloney. It was a celebration of another year of having their faith recognised after the repeal of the Shouters Prohibition Ordinance and it was also the official opening of the new Maloney overpass to assist pupils of the St Barbara Spiritual Shouter Baptist Primary School. The school was opened last year by Prime Minister Kamla Persad-Bissessar after the Baptist community waited more than a decade to acquire the land to build the facility. Archbishop Barbara Gray-Burke said the school was not built by man, but by “the Spirit”. “It is doing magic for us, the walkover means so much for us,” Gray-Burke said during the service at the Empowerment Hall. The PM was unable to attend yesterday’s function as she has been ordered to rest by her doctors, suffering from a bout of the flu. National Diversity and Social Integration Minister Clifton De Coteau, addressed the gathering on the Prime Minister’s behalf, urging parents and guardians to encourage their children to use the walkover, adding Government was taking a strong stance on crime. He said everyone must be brought on board in the fight against crime. “When we look at the levels of crime and anti-social behaviour in our country today, we know that a tough stand must be taken and maintained to break this cycle of violence. Crime and the arrest of crime in our country is the number one priority of Government at present,” De Couteau told an audience of elegantly dressed members of the Baptist faith. “We have a crime problem that is just out of control when it comes to murders. Yes, we have reduced serious crimes, but we need to do more. us back, nothing shall prevail against us,” he vowed. De Couteau said each citizen had a responsibility to transform Trinidad and Tobago from a country that was seemingly moving towards lawlessness, and bring it back to the country’s watchwords — discipline, production and tolerance. 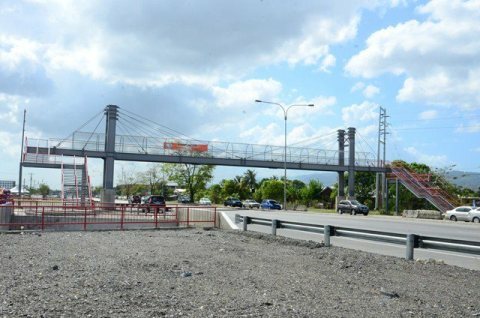 A great project thanks to the Prime Minister of Trinidad and Tobago for her vision of this project.